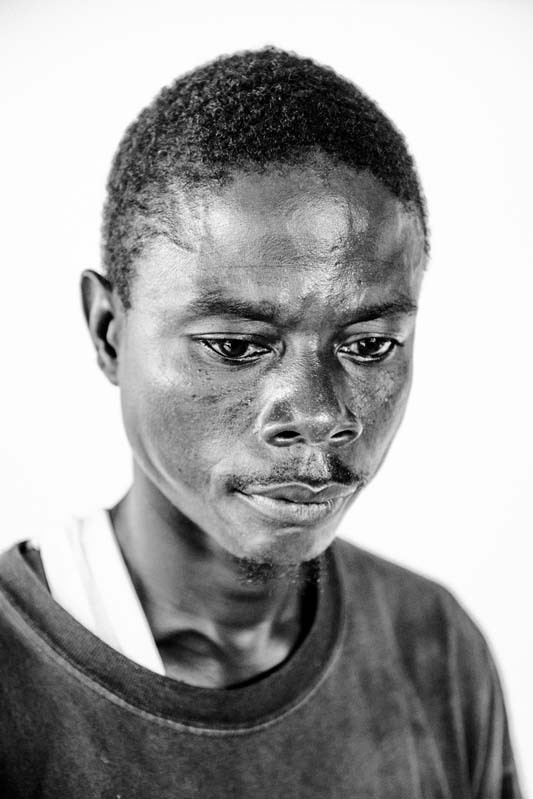 SUAKOKO, LIBERIA - OCTOBER 16, 2014: George Beyan, 34, a farmer and Ebola survivor, from Nwamu near Bong Mines, stands for a portrait after being released Ebola negative in the Bong County Ebola Treatment centre on October 15, 2014 in Bong County, Liberia. "I got up in the morning, I prayed. In the evening, I prayed. At dinner, I prayed. Prayed to get well. Yesterday they said, 'You, you're free.' I danced, I jumped." He contracted Ebola after carrying a sick friend in a hammock. He is pictured here on the day he was told his Ebola blood test was negative. He also heard that his family members were en-route to the ETU with symptoms of Ebola. His wife and two children, aged 5 years old and 6 months old, were tested for Ebola. Evtnually, his wife Esther tested negative, as did the 6-month-old. William, 5, however tested positive. George, having been released, waited at the ETU for the results of the tests. He was free to go home. The staff at the IMC spoke to George after his real ease and explained he would be the best person to look after his son. George re-entered back into the high-risk conformed area, having his immunity to keep him safe, to look after William. William died a few days after.